The benefits of soy wax candles have convinced many candle makers to use only soy wax for their creations, and candle enthusiasts to choose soy over candles made from other types of wax. Soy can be a terrific medium to use for candles, but as with all products, it's important to read labels and know exactly what you're getting. Soy wax is made from soybeans, and is a solid form of hydrogenated soybean oil, making it a natural and renewable product. Unlike paraffin, which is a by-product of crude oil refining, soy wax is a relatively pure compound with which to make candles. There are many real benefits to using soy when making candles, or purchasing candles made from soy wax. Soy can be more expensive than paraffin, but the benefits of soy wax candles can be worth it. Since soybeans are grown extensively, soy wax is readily available and renewable. Other natural candle waxes like beeswax or bayberry wax can be very expensive and their supply is limited. On the other hand, soy is a consistent and viable alternative for those who prefer candles made from natural, renewable sources. 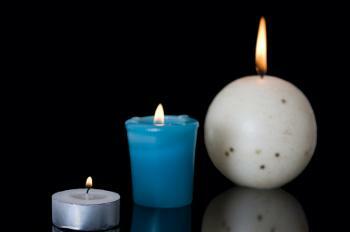 Soy wax burns more slowly and evenly than paraffin, so candles will last longer. Even though you'll pay a little more for soy, the fact that your candles burn longer helps to offset the extra expense. Many people claim that the lower heat of a soy candle will also ensure that the scent will last longer, but this tends to depend more on the quality and amount of scent oil in the candle than the heat of the wax. Candles made from soy wax burn cleaner and produce much less smoke than those made from paraffin. This means that anyone sensitive to candle smoke will have a much easier time with soy wax, and the air will be cleaner and safer for everyone, especially young children and the elderly. There is also less risk of smoke damage to nearby furniture, walls, or ceilings. Soy wax has a lower melting point than paraffin, so the wax turns softer at lower temperatures. If you find yourself with a soy wax spill, it can be cleaned up with soap and hot water rather than harsh chemicals. For candle makers, this is also a handy feature since equipment can be cleaned in the sink under hot running water, or even in the dishwasher. Most forms of candle wax are simple to work with for candle makers, and soy wax is no exception. It is almost as adaptable as paraffin, and you can color and scent the wax, or create interesting shapes and designs in the same way as you would any other candles. Soy can be mixed with other types of wax, such as beeswax, to create interesting blends. While there's no doubt that soy wax is a great product, as a consumer you should keep your eyes open and read labels to make sure you're getting a genuine soy wax candle. Here are some tips for candle purchasers and crafters alike. Be wary of cheap candles that claim to be made of soy wax. Many of these dollar store gems are actually made with a paraffin/soy blend that can be very skimpy on the amount of soy wax that's incorporated into the mix. Since soy wax can be a softer medium than paraffin, additives are often added to make the wax harder. If you're at all concerned about the additives, ask the candle manufacturer or crafter if the product is indeed 100% natural. Other candle additives can include fragrance and color. Often these additions can be natural, such as essential oils and vegetable-based dyes. When this is the case, these details are almost always noted on the label. If you haven't tried candles made from soy wax, it's worth picking up a few to see if you notice a difference. You just might find that you prefer them!